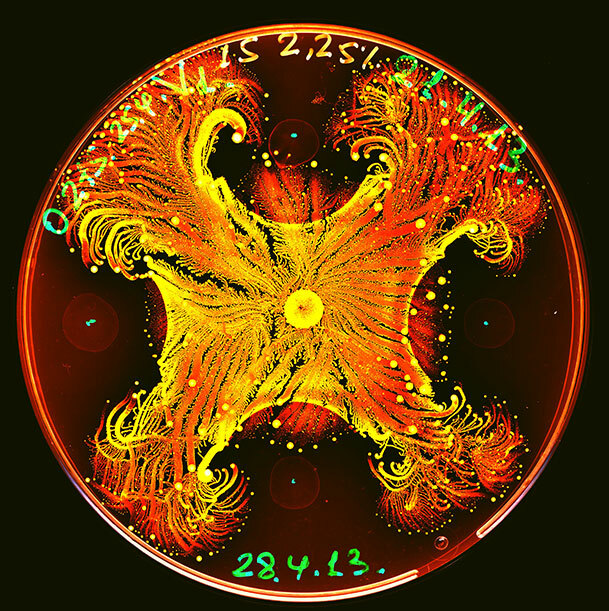 This beautiful image is of P. vortex, a bacteria species discovered in the ’90s by Eshel Ben-Jacob and his colleagues at the University of Tel Aviv. In an attempt to better understand the new species, Ben-Jacob tweaked various growth conditions, like temperature, light exposure, or nutrient consistency, and recorded the bacteria’s response. He soon found that the colony responded as a unit, resulting in distinctive patterns of movement and growth. Add a little dye, and boom – bacterial art. To learn more and check out some of his other work, see here.